The idea for a rock and roll band began when Rob Brink, Randy Gacke and Al Nelson got the urge to join the music revolution sweeping the country in the early 1960s. In the summer of 1963, with only one guitar and a guitar case substituting as drums, the three teens called radio DJs in the Sioux Falls area, played them a song over the phone, and asked for feedback. They got positive reviews, so they got a real drum set, added a guitar, and started learning songs popular on KISD radio. After a short time, Bob Linton, Lee Kriemann and Cam Thraen joined the group, and the first incarnation of the band was formed. Lee came up with the name Sad Lad and the Mourners. Randy’s father, Reg Gacke, became their manager. During the New Year’s Eve holiday in 1963, a band booked for two nights at Johnny White’s bar at 8th and Phillips in Sioux Falls was trapped in a Kansas snowstorm. Reg Gacke got a call asking if Sad Lad and the Mourners could fill in for one night. Since each member was only about 15, at least one of their parents had to accompany them as they played their first paying gig. That first night, the clientele began to change from about 15-20 older and mostly inebriated people to 30 or so college students. The second night, the band played to a packed house of college-age people, and the rest is history. Their first dance hall gig was in early 1964 in Valley Springs, SD. After that, they played one or two nights a week from 1964 through 1969 in dance venues throughout South Dakota, Iowa and Minnesota. Some of the band’s venues: Dell Rapids Ballroom in Dell Rapids, SD; Roof Garden in Arnolds Park, IA; Hollyhock Ball Room at Hatfield, MN; Cobblestone Inn in Storm Lake, IA; Showboat Ballroom at Lake Benton, MN; Ruskin Park in Forestburg, SD; the Augustana College campus, where Bill Van Dusen from KELO-TV made an audio recording of the band; South Dakota State University; various high school homecomings and other school dances; and hundreds of other locations, small and large. One of their greatest thrills was being a backup band for the Turtles at the Sioux Falls Arena in 1967. Sad Lad and the Mourners’ last gig was in 1969 after which it came under new management by James Reardon and was renamed The Fabulous Apostles. 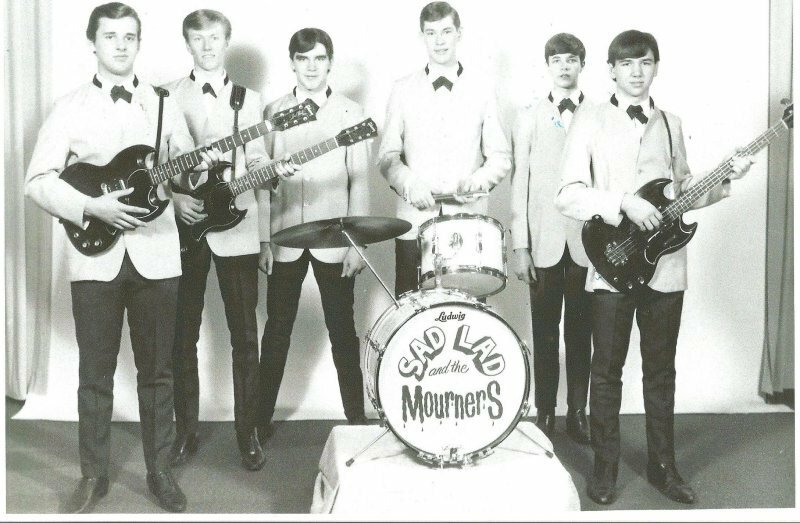 Additional members who joined from 1965-1968 before the name change and therefore not already inductees in the South Dakota Rock and Roll Hall of Fame are: Lou Kindred, lead vocals; Dale Westendorf, lead guitar and vocals; Ron McKenna, lead trumpet; Art Sieler, organ and vocals; and Dan Christensen, bass guitar and vocals. Members who were part of Sad Lad and the Mourners when it changed to The Fabulous Apostles and are current Hall of Fame inductees are Willie Bertsch, lead vocal and trombone; Rod Anderson, lead guitar; Ken Huseboe, lead trumpet and vocals; Al Christopherson, bass guitar and vocals; Jerry Moore, organ and vocals; and Gary Swanson, drums and vocals.